Whether you are a novice snorkeler or a veteran scuba diver, an encounter with a sea turtle is always a special moment. They are likely to show up at most every diving and snorkeling destination in the tropics, and are usually tolerant of humans. 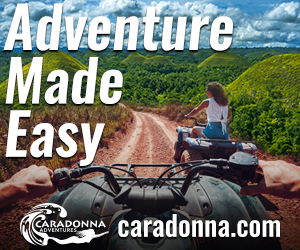 Over the years, we at Caradonna Dive Adventures have heard lots of stories and seen many photos from clients who swam with turtles at destinations we represent. Here’s some of the things we’ve learned and shared about these most ancient of sea creatures. There are seven known species of sea turtles swimming in the world’s oceans, but only three that you are likely to encounter when diving or snorkeling. These are hawksbills, loggerheads and greens. They are found in tropical waters worldwide, and often come close to shore. These guys are one of the smaller members of the sea turtle family, growing to sizes of two to three feet, weighing between 100 and 150 pounds. The name comes from their tapered heads, which end in a sharp point that looks a bit like a parrot’s beak. Hawksbills use their beaks to pick apart marine sponges, which are their favourite food—though they will also nosh on mollusks, sea urchins, jellyfish, small fish and even algae. These turtles are quite common in the Caribbean. They don’t usually make long migrations, and tend to spend a lot of time close to shore around coral reefs, grass beds, lagoons and mangrove swamps. They aren’t shy or skittish, and when they don’t feel threatened, become curious, and may approach a human swimmer. These far-ranging turtles can be found as far north as the coasts of Newfoundland and Oregon, but are more common in warm water. The easy way to identify a Loggerhead is by its thick head and muscular neck, which do look a bit log-like. These turtles have powerful jaws that can crush shells, and they usually feed on things like crabs, clams and conch, though they won’t turn down a jellyfish or a sea urchin. Adult loggerheads are usually in the three-foot range, and the big ones can tip the scales at more than 300 pounds. They are usually less gregarious when interacting with humans, but are more likely to be indifferent towards humans rather than skittish. Snorkelers and divers are most likely to run into a loggerehead turtle during nesting season, which takes place form April to July in the northern hemisphere. During these months, the mature females return to the same beach where they were hatched, and come ashore at night to dig their nests and lay a clutch of eggs. These ladies will often nest three to five times over the course of a season, and will spend their days between nestings resting in on the sea floor, with their heads tucked up under a ledge. It you happen across the hind end of a large turtle sticking out from a crevice in the reef, don’t disturb the animal, because it is resting up from a hard night of parenting. Green turtles are the largest sea turtles you will probably ever see. They often grow to 400 pounds and four feet, with the largest specimen on record coming in at almost 900 pounds. The only species that grows larger is the leatherback, and they are rarely spotted on reefs. Greens are widespread in tropical and subtropical waters around the world. They usually stick close to shore, which increases the chances of interactions with snorkelers and divers. In the Caribbean and Atlantic, their shells are usually dirty white or yellowish, while populations in the Pacific and Indian oceans may tend towards a bluish-green shell color. Don’t let that fool you—they are all the same species. Adult green turtles are vegetarians. After hatching, they spend their early months nibbling on sponges, crabs and worms, but as they grow, they switch to algae and sea grass. 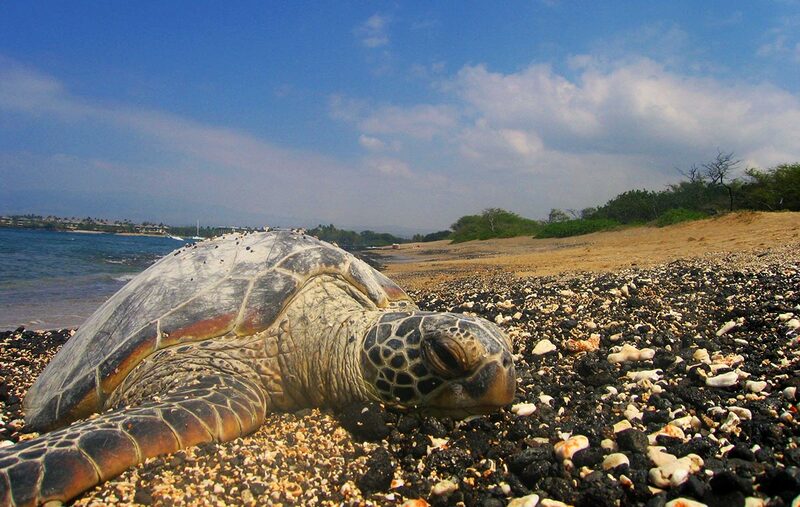 Venture into the shallow waters of a sea grass meadow and you may find a green turtle noshing on the vegetation. And that’s a good thing, because their grazing is a benefit rather than a threat to the plants. Turtles don’t just grab a mouthful of grass, they focus on the younger and more nutritious mid sections of the blades, while older and less nutritious top portions are bitten off and left to float free and drift away. This close cropping encourages new growth. Studies show that when turtles graze, they create a marked increase in the productivity and nutrient content of the grass bed. Without turtles, grass beds would suffer. Plants would overgrow and fill the sea floor with decomposing material that block nutrients from reaching roots, and promote the growth of slime molds. Sea turtles are not amphibians. They are air-breathing reptiles with lungs, which means they have to come up for air every so often. That said, they are world-class breath-holders. An active turtle that is doing a lot of swimming and grazing may need to pop up every 10 to 30 minutes, but when they tuck under a ledge and nap, they can stay submerged for six hours or more. When a turtle does surface, it doesn’t have to spend much time prepping for the next dive, as it can replenish its air supply with a single strong exhalation and a full inhalation. Turtles have large lungs, which not only provides an ample reserve of oxygen, it also allows them to dive to greater depths without fear of lung collapse. While sea turtles mostly stay within 20 to 80 feet of the water’s surface, they are capable of diving to depths of 500 feet. Big turtles are old turtles. After an initial growth spurt, a green turtle will grow at an average rate of less than two inches a year. It takes them around 20 years to get to the two-foot range, and if you happen across one with a shell larger than three feet in length, it’s probably around 40 to 50 years old. These turtles also wait to mate, as they don’t reach reproductive maturity until sometime in their late 30s to mid-40s. Once they enter the breeding population, female turtles become creatures of habit, travelling for distances of up to 1,600 kilometres to return to the same beach each time they lay their eggs. Scientists haven’t been tagging and studying turtles long enough to gather conclusive evidence on lifespans, but we know that hawksbills often reach the age of 50, loggerheads can make it past 70, and green turtles can live for at least 100 years if all goes right. When you see a turtle gliding along the reef, it’s only natural that you’d want to fin over for a closer look, and maybe grab a photo. Nothing wrong with that, so long as you don’t end up harassing the turtle. Most of the time, a green will ease along at about a mile an hour. But if they feel threatened, they can make short sprints of up to 30 kilometres an hour. And just as you’d be winded after a fast sprint, this escape behaviour will tire the turtle and may force it to come up for air at an inconvenient time. The best way to approach a cruising turtle is to come along side and swim parallel, matching the animals swim pace and holding a position where the turtle can see you. This will send a message that you aren’t pursuing, but are just heading in the same direction. After a few moments, you can begin to ease in closer while maintaining the same side-by-side position. Sometimes you’ll be able to get within a few feet, but if the turtle speeds up or veers off, let it go and don’t pursue. A different etiquette applies to resting turtles. They should be left alone. After all, no one likes to be woken up in the middle of a nap. 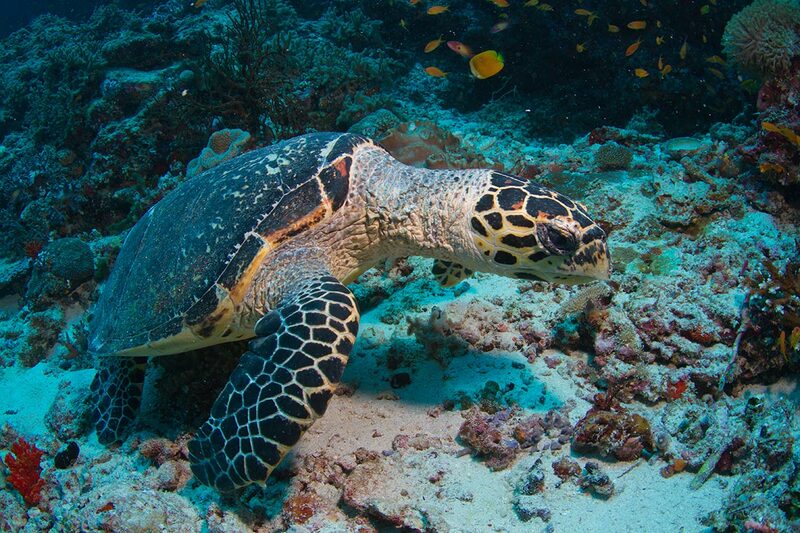 Sipadan, Indonesia—Snorkelers are almost guaranteed to see green and hawksbill turtles swimming along the steep underwater drop-offs that surround this small offshore island. 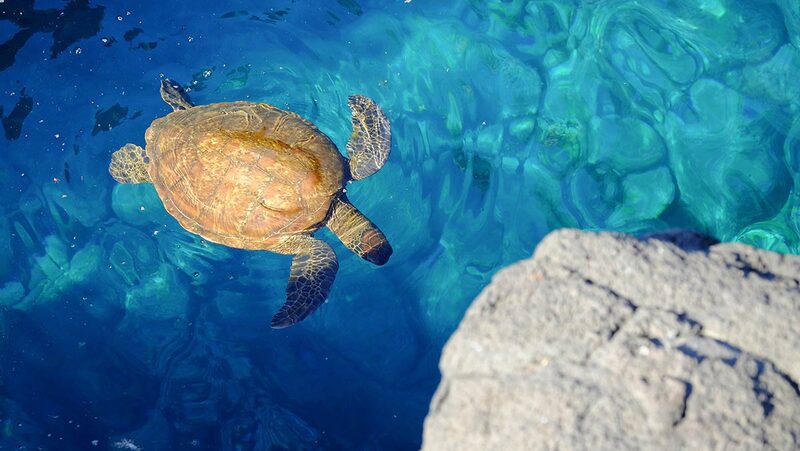 Maui, Hawaii—Green turtles hang close to the beach at sites such as Honolua Bay, Black Rock, Napili Bay, Wailea Point and the aptly-named Turtle Town. Bora Bora, The Islands of Tahiti—The island’s picture-perfect lagoon is a haven for both green and hawksbill turtles, and several resorts run sanctuary programs that bolster turtle populations. Carlisle Bay, Barbados—In addition to almost guaranteed sightings of green and hawksbill turtles, this marine sanctuary offers a collection of shallow ship wrecks. Akumal, Mexico—Roughly 100 kilometres south of Cancun, Akumal’s Turtle Bay lives up to its name, with a year-round population of green turtles that hang close to shore. Diving with sea turtles?! That’s the most interesting thing I have ever heard. Would love to try as soon as I have the opportunity. Besides golf, traveling and experiencing are my hobbies. So this definitely will be on my list. I just wonder if this activity is environment-friendly (and I really hope it is). Thanks for sharing!